The second is called a Direct Current Quick Charger (DCQC). These chargers can charge the car from empty to 80% charge in about 30 minutes; although we’re rarely completely empty when we arrive, so typically we spend about 20 minutes at each charger. The connector used on the LEAF for this is called CHAdeMO. Another type of connector now emerging is called the SAE J-1772 Combination Charging System (CCS), called “Combo” by most of us. The third charging method is called Level 1. This is what we get when we plug our vehicle into a standard 110-120 volt wall outlet like you have all around your home. Because these outlets are typically rated for a constant draw of 12 amps (or 15 amps instantaneous), the charger that comes with the car will only draw 12 amps through this method, which results in a draw of 1.4 kW or less. It would take the car approximately 20 hours to charge from empty to full using this method. Luckily, for the majority of our 1,500 mile road trip, we are able to utilizing DC Quick Chargers, although we have also used Level 2 and Level 1 charging along the way. Most of the quick chargers we’ve used are part of a network of chargers called the West Coast Electric Highway. These chargers, built and operated by AeroVironment, are placed at businesses along major highways in Washington and Oregon. California was supposed to participate but has not yet built any chargers on the network as of this writing. This is why when we reached the California border, we immediately turned around. Washington has about twelve chargers on the network, and Oregon has about 43. Because these AeroVironment quick chargers are placed near highways, and they don’t take very long to use, they facilitate long-distance travel in a Nissan LEAF (and a couple other electric car models). They are typically placed every 20 to 40 miles, which makes it easy to hop from one to the next, or even skip every other charger. Major metropolitan areas, including the areas around Seattle-Tacoma, Portland, and Salem, do not include any chargers on the West Coast Electric Highway, because a company called ECOtality was given an exclusive government contract to build quick chargers in these areas. Unfortunately, ECOtality, which operated the Blink Network, did not fulfill its obligations to place all the chargers in these areas, and then filed for bankruptcy, leaving the Blink Network in disarray, and making it difficult to travel in these areas. Blink Network has since been purchased by another company and they have restored service to the majority of the chargers in these areas. However, they still haven’t built the additional chargers required by their government contract, which would allow for easy travel through the area. 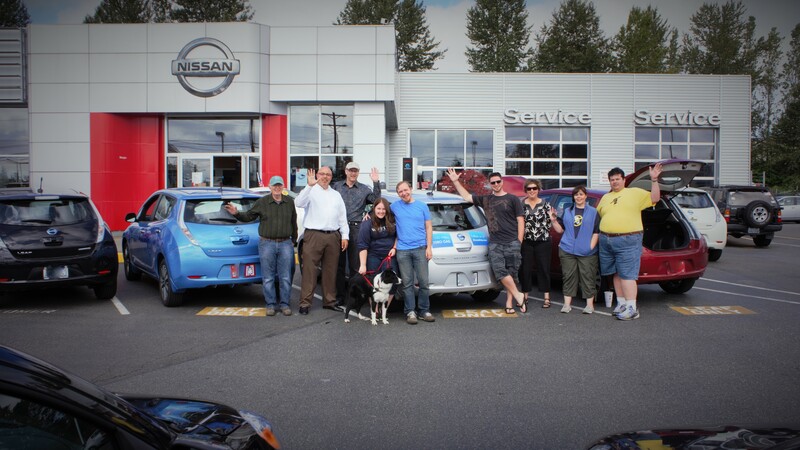 As a result of this, and other factors, when traveling through the Seattle-Tacoma area we depended instead on chargers located at Nissan dealerships. 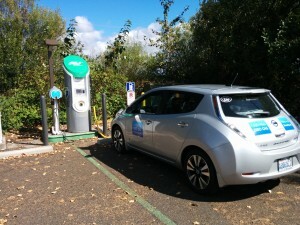 In the Portland area, we charged at a charger operated by Portland State University for research purposes. We could have relied on these quick chargers for the entirety of our travels. However, we chose to also do some Level 2 and Level 1 charging in order to save time and to reach one of our goals. When we were in downtown Seattle and downtown Portland, we used Level 2 charging because we had stopped to either shop (Seattle) or visit (Portland) and didn’t actually need much charge to get to the next quick charger. We also did this in Centralia, WA. Along the very southern end of the Oregon coast, there are no quick chargers, so we used a Level 2 charger to be able to get to the California border and back. At our campsites, we’ve used either Level 2 or Level 1 charging where possible. Ahead of our trip, we purchased a couple things to make this possible. 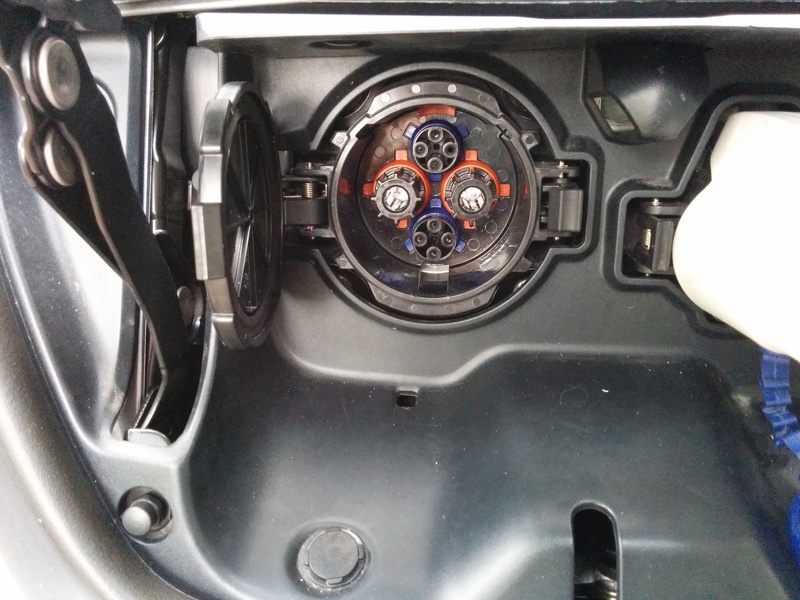 The LEAF comes with a Level 1 charging adapter (called an EVSE, Electric Vehicle Servicing Unit). We sent our unit to a company called EVSE Upgrade. This company replaces the internal electronics of the unit so that it can also support Level 2 charging, and faster Level 1 charging. The stock unit will support Level 1 up to 12 amps, as I stated before. The upgraded unit will support Level 1 up to 16 amps, and Level 2 up to 24 amps. 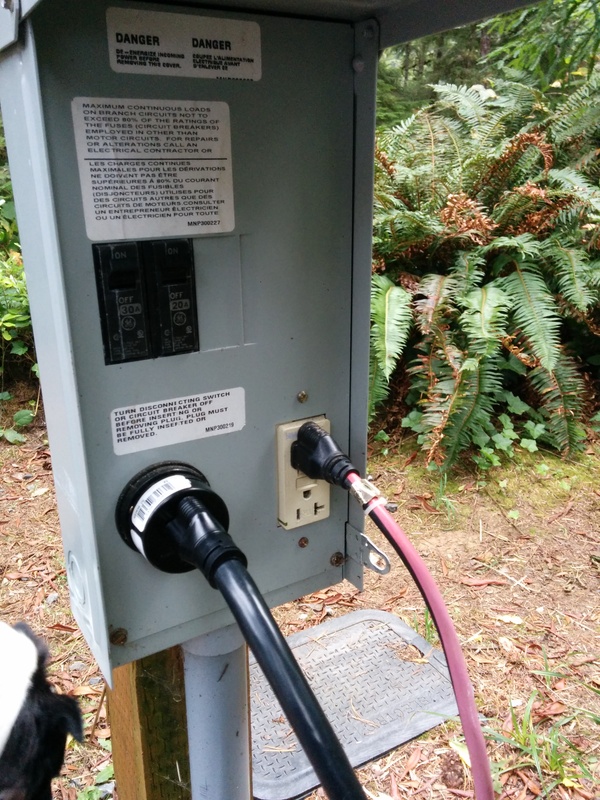 We also purchased an adapter from them that will allow us to plug in to the outlets at campgrounds (NEMA 14-50). Some of our campgrounds have had a plug called a TT-30, which provides up to 30 amps of 110-120 volt service. We have an adapter from TT-30 to the standard outlet and set the EVSE to the maximum of 16 amps to charge with this. Others have the 14-50 so we can charge at the full rate supported by the EVSE, 24 amps. A couple of the camp sites have had no power at all. Charging at camp allows us to start off the following day with a full charge. Some days this allows us to cruise around and explore the area. Other days it allows us to skip a quick charger along the route, in order to get to our next stop faster. Electricity is easy to find if needed, and having lots of options for charging also means that if any emergency situation should come up, we would be better prepared to deal with it. However, so far we haven’t found ourselves with less than even 25% charge, so we’re far from experiencing such an emergency situation. TT-30 to regular outlet…where did u find this adapter? it looks like a simple plastic base, not a cable? Thanks so much. Your trip sounds amazing! Yeah, it’s not a cable just a simple adapter. I think I got it from Platt. How does your modified EVSE know if it should pull 12, 16 or 24 amps? It can be programmed at any time for any amperage (in 1 amp increments) between 5 and 24 amps on 220 or between 5 and 16 amps on 110. How is it that you program it? Button pushes? Bluetooth linked smartphone app? It involves pushing a button and some other steps. Instructions come with the unit and can be found on the EVSEupgrade website. That is the most informative post about the real world aspects of charging an EV that i have read anywhere. Thanks for taking the time to explain things so clearly. We carry a JESLA (mfg in the Tri-Cities) which allows me to do Level 2 charging at most state parks. We also have year passes to Washington and Oregon state parks. This helps in negotiating outlet use if not actually camping. To make ourselves useful during charging we carry litter pickup tools and a plastic bag. This is especially appreciated in Washington where our legislature has vastly underfunded our state park system. Zero Emission Road Trip – Update 2 – Hello, California!